After having had a bit of fun with that puppy drawing, it was time for some serious drawing. 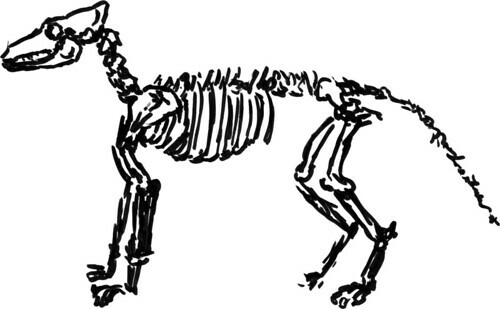 So I decided to draw a dog skeleton, based on an illustration in the excellent book by J.C. Amberlyn Drawing Wildlife. I wanted a rough approximation, to get a feel for the proportions, but still draw from looking at the illustration instead of measuring it and trying to reconstruct it. I think I’ll need a few rough sketches, try a few with the dog underneath it, and then try to figure out where the skeleton is in a reference photo of a short-haired breed dog. I should do something similar for a human being, and then find out how both animals compare and differ. This should give me a clue how to turn a cartoon human into a cartoon dog. At least, I hope it does. In any case, a thick marker is an advantage here, because you really can’t fuss over your lines. The huge size of the point simply doesn’t allow it. You need to get it on paper the best you can without the possibility of corrections. I personally think that using a marker to draw keeps you focussed. Once you’ve learned the basics, you can switch back to the safety net of a pencil and eraser, or even a computer and Control-Z (Command-Z on the Mac), for a more precise construction. In my experience, constructing drawings without a basic feel for you subject is a sure method of making your drawing look lifeless, because it is too cerebral, too doctored. A good drawing comes from within, from your passion for the subject.